Try a dip of deliciousness. 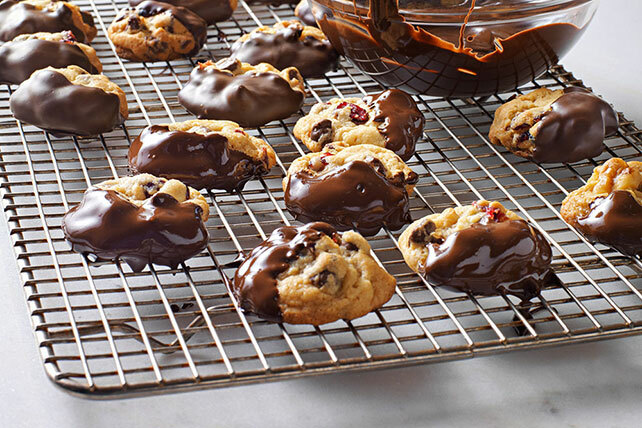 Made with walnuts, dried cranberries and a secret ingredient, these chocolate-dipped chocolate chip cookies are scrumptious. Beat butter, sugars, pudding mix and vanilla in large bowl with mixer until blended. Add eggs and baking soda; mix well. Gradually beat in flour. Stir in chocolate morsels, cranberries and nuts. Bake 8 to 10 min. or until golden brown. Cool on baking sheets 3 min. Remove to wire racks; cool completely. Dip half of each cookie into melted chocolate. Place on waxed-paper covered baking sheet; let stand until chocolate is firm. When baking these cookies in a high-altitude area, increase the baking time to 9 to 11 min. or until cookies are golden brown. Prepare dough as directed; spread onto bottom of 13x9-inch pan sprayed with cooking spray. Bake in 375°F oven 20 to 25 min. or until golden brown. Cool before cutting into bars.